We are going back to beautiful STONEWALL RESORT! And I would love for you to join us! *Resort Amenity Fee: There is a $17/room per night fee that includes admission into the park, use of indoor/outdoor pool, use of fitness center, use of the steam and sauna rooms, all local and toll free calls, high speed and wireless internet service, use of the shuttle throughout the park, use of the Business Center computers and printers, access to a 20 ft. boat slip at the Marina during your stay (when available), hiking/biking trails, basic fishing equipment and free parking and valet service. The Suites have been remodeled and changed. They are now called JUNIOR SUITES. I believe they are all in one room - the bed, living room, dining room, kitchen with bath. (No longer a separate room for the bedroom.) If you are interested, be sure to get all of the details when you call to reserve one to make sure it's everything you want! I've also reserved an JUNIOR KING SUITE that sleeps up to 6 people. The suite is $192 per night and includes one bedroom with 1 king bed and a sleeper sofa and a living room/dining room/kitchen with mini fridge and microwave that sleeps 2 on the queen sleeper sofa! If you split the cost 6 ways that's only $32 per night! There is only ONE available on a first come, first served basis. Be sure to call Stonewall to reserve this suite and then let me know it is taken so I can post it here. I've also reserved an JUNIOR QUEEN SUITE that sleeps up to 6 people. The suite is $192 per night and includes one bedroom with 2 queen beds and a living room/dining room/kitchen with mini fridge and microwave that sleeps 2 on the queen sleeper sofa! If you split the cost 6 ways that's only $32 per night! There is only ONE available on a first come, first served basis. Be sure to call Stonewall to reserve this suite and then let me know it is taken so I can post it here. I've also reserved the PRESIDENTIAL ROOM SUITE that sleeps up to 10 people. The suite is $295 per night and includes one bedroom with 2 queen beds, another bedroom with a king bed and queen sleeper sofa, and a living room/dining room/kitchen with mini fridge and microwave that sleeps 2 on the queen sleeper sofa! This suite has 3 full bathrooms! If you split the cost 10 ways that's only $30 per night! There is only ONE available on a first come, first served basis. Be sure to let me know if you are interested in reserving this space! Doors open at 1pm on Friday, February 8th and close at 3pm on Sunday, February 10th! I can provide electric at your cropping table. Let me know if you would like it and if you can bring a surge protector and extension cord! I will also have a tool table with a Cricut, Cuttle Bug, stamps and ink. Be sure to bring your own Cricut Mat to use. If you are eating at the Stillwaters Restaurant at the Resort, our dinner times are 5pm and 6pm. If you are eating at TJ Muskies Bar and Grill at the Resort they are open from 3pm - midnight. (Lunch and dinner are own your own.) Reservations are recommended but not necessary. 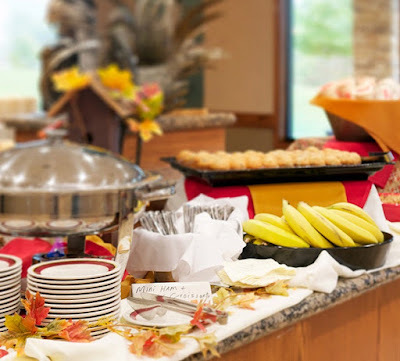 For those on a meal budget, TJ Muskie's is an economical choice OR you can use the mini-fridge in your room, or reserve one of the suites with a kitchenette or one of the cottages with a full kitchen! At this facility, we CAN NOT bring our own snacks/drinks from outside into the ballroom, but you can have them in your hotel room or suite. 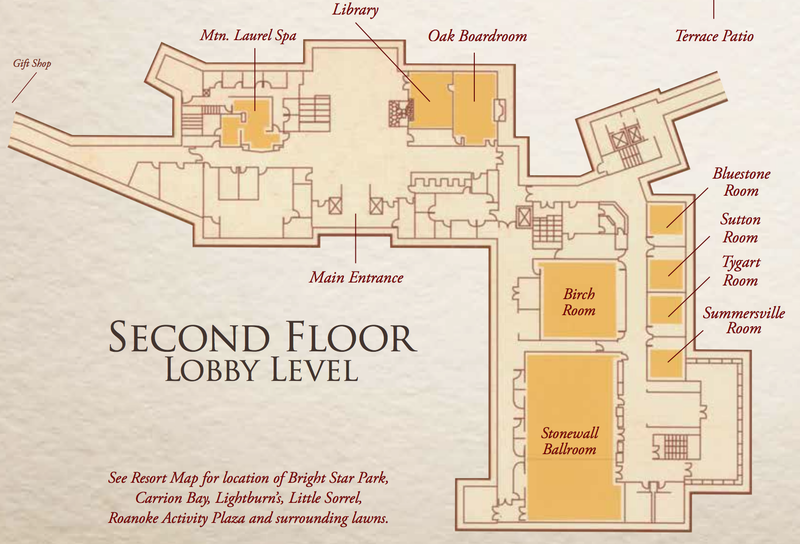 The Resort will provide our beverages right outside of the ballroom. Prices have gone up slightly for the first time in years! BUT I believe we are getting more BANG for our buck this year! This year we will have the Birch Room for our workshops - the room right beside the ballroom! No more running up and downstairs for workshops! 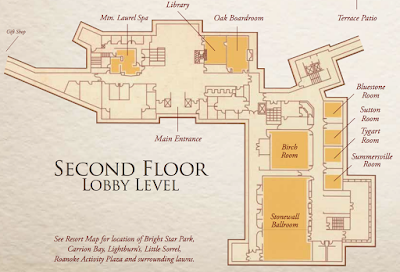 It's twice as big as the Maple Room and WAY more convenient! I'm super excited about this! Beverages and Snacks are included in your crop fee and will be provided just outside of our cropping room. You can bring these items into the ballroom. Every cropper will receive their own table along with an executive swivel chair! TRUST me, these chairs are the bomb! As you know, this will be our 7th year returning to Stonewall. And this past year we had more croppers than ever! We also exceeded Stonewall's supply of 6' x 2 1/2' tables! So they substituted 6' x 2' and 8' x 2' tables where necessary. In reading our surveys, (YES - we read every word!) some were disappointed with the table they were given. Let me just say now, I have no control over that. When you arrive, if you are disappointed with the table you've been given, please ask if one of your neighbors would like to trade. Honestly, we had some who mentioned on their survey that the LOVED the more slender tables and some who felt cheated! We can't please everyone, but we sure try our best! See if a neighbor would like to trade with you if necessary. A variety of workshops will be prepared for you to participate in, either at your table or as a class. Please let me know if you would like to pre-register for any workshops or products so that I can have them ready for you at the crop! Only a few extra will be prepared for each class, so it's important to pre-register! You can view the workshops and kits on my Stonewall Resort Crop Facebook Group closer to the actual date. There will be plenty of prizes to bid on with your crop cash! What are YOU willing to do for a buck? Receive a 20% discount on spa services at the Mtn Laurel Spa when you reserve at least 7 days in advance of arrival and mention you are with the Creating With Christine Group! You can always let Santa know that you "need" a massage or facial this weekend! You won't be disappointed! Contact me to reserve your spot at this amazing weekend getaway! Space is limited to 75 special people! OR click the JOIN GROUP button below now. It is important to realize that I contract with the facility and have to pay for the entire space and services regardless. Your crop fee covers an equal portion of the contract. If you cannot attend, I still need to pay for your spot. However, I fully understand that sometimes circumstances occur that would prevent you from attending (illness, death in the family, etc.). With that in mind, if you reserve a spot and are unable to attend, you may transfer your fee to a friend and work out reimbursement directly with them. I simply won't have time this year to try to find a replacement for you. However, if I have a waiting list, I'd be happy to refer the next in line to you! I just now saw this. Wish I could come but have previous commitments, plus I am going to a retreat in Ohio Amish country the following weekend. Do you have them just once a year. . The past few years I have had a fall weekend crop in Huntington and a winter weekend crop at Stonewall. I also have all day crops at my home in Cross Lanes. I will advertise the next one here on my blog, or I can add you to my mailing list if you would like. I simply need your email address and your permission! I'd love to have you join us in the future! Have fun in Amish country! What are the exact start and end times. What is the closest airport please. How big is each persons crop space? Paige, each person is given a 2/1' x 6' table with a super comfy, padded, executive swivel chair! That should read: 2 1/2' x 6' table. How much is crop fee? I seen the room rate. Darla, the crop fee is $105. Hey, Christine. I just wanted to make sure I was signed up and confirmed for this crop. I seem to have lost all of my emails from you! I know I paid, but I just want to make sure. I think Jeanie Bord already requested to sit with me and also Jessica Sapp. Can you let me know? Thank you!